The extraordinary galaxy Markarian 231 was discovered in 1969 as part of a survey searching for galaxies with strong ultraviolet radiation. It has long tidal tails and a disturbed shape. Results from the first spectrum showed clear signs of the presence of a powerful quasar in the centre that made Markarian 231 unique in the Markarian sample. Markarian 231 has maintained its reputation as an exceptional object since those early observations and continues to be a favourite target in all wavelength regimes. Its infrared luminosity is similar to that of quasars, making it one of the most luminous and powerful known ultraluminous infrared galaxies. Although the emission of many ultraluminous infrared galaxies appears to be dominated by energetic starbursts, Markarian 231 has been repeatedly identified as an exception and many pieces of evidence point toward an accreting black hole as the major power source behind the enormous infrared luminosity. Although the primary power source behind the incredible far-infrared luminosity of Markarian 231 is almost certainly an active nucleus, the galaxy is also undergoing an energetic starburst. Most dramatically a nuclear ring of active star formation with a rate estimated to be greater than 100 solar masses per year has been found in the centre. 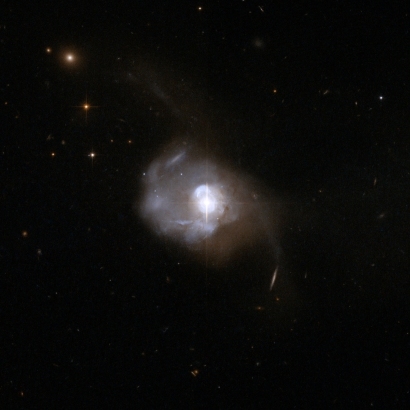 Markarian 231, or UGC 08058, is located about 600 million light-years away from Earth. This image is part of a large collection of 59 images of merging galaxies taken by the Hubble Space Telescope and released on the occasion of its 18th anniversary on 24 April 2008.